Do you want $100 discount of this software? Write an email to: info@aostrading.cz for the discount code. Once you have identified an “edge” in a market – a robust and winning trading system – the biggest opportunity for profit lies with tools for trading your system more successfully. Market System Analyzer (MSA) helps you to utilize so-called money management methods, such as position sizing. MSA is designed to help maximize the performance of trading systems and discretionary trading methods by optimizing trade sizes and avoid trades and strategies that have a low likelihood of success. The result is a higher percentage of winning trades, lower drawdowns, more consistent returns, and greater profitability. MSA analyses trading systems in terms of their individual winning and losing trades. The purpose of this software is to maximise the amount of information about a trading system. All of the software´s analytical tools are very easy to use, which is one of its greatest advantages. Ability to combine trading systems into one portfolio. 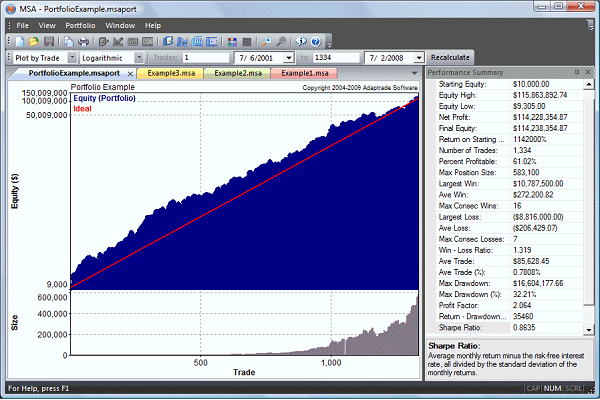 Monte Carlo analysis the purpose of which is to quantify the effect of trade order randomisation on the trading system´s overall performance (determination of the worst drawdown possible). Position sizing optimisation the aim of which is to maximise the trading system´s performance by the use of the most suitable position sizing method. Dependency analysis which serves for determining whether the trading system has a statistically significant tendency to generate more winning or losing trades in a row. Significance testing the purpose of which is to determine the probability that the trading system is inherently profitable.